The Way of Council is a group communication process that draws on concepts of democracy and inclusivity. Problem-solving skills are taught in a manner that is not based on forcing one person’s will onto the other, but in a way that engenders respect for the other while finding common ground and making decisions based on common interests. Council is consciously built on a foundation of shared values. It assumes a universal human wish to be connected to others in a good way. Values that nurture and promote good connections to others are the foundation of the Circle. Council is used in many schools and organizations to create a sense of teamwork, belonging, trust, fellowship, and community. Most importantly the Way of Council teaches children how to listen deeply to the other. 12,000 childen in Los Angeles schools participate in Councils. 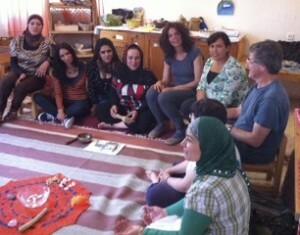 http://cis.ojaifoundation.org/ Currently the Jewish Arab school, Ein Bustan, is in a multi-year training to become a “Listening School”. A school becomes a “Listening School” when the Way of Council becomes an integral part of the school culture for students, parents and faculty. Future plans involve Way of Council training for reGeneration’s other projects. The basic practice of Council is simple: a group of people sit in a circle. Drawing on indigenous traditions of using a talking piece, an object is passed from person to person in a group sitting in a circle which grants the holder solid permission to speak. Each one has a voice, speaks from their heart and all the others listen. The Way of Council invites active participation in the learning process. The Councils draw on the life experience and wisdom of all participants to generate new understandings of the problem and new possibilities for solutions. It brings together the ancient wisdom of community and the contemporary value of respect for individual gifts, needs, and differences. The Way of Council, a listening circle, is a good ancient tool. I know that by participating in circles people can release their fears, prejudices and stereotypical expectations. Sitting in a circle with heart communication creates connection and acceptance. When their perception shifts in this way, love and respect comes through. That’s a powerful tool. Councils are a storytelling process. They use the history and experience of everyone in the Circle to understand the situation and to look for a good way forward – not through lecturing or giving advice or telling others what to do, but through sharing stories of struggle, pain, joy, despair, and triumph. Personal narratives are triumph. Personal narratives are the source of insight and wisdom in . It becomes much harder to hold someone as the distant “other” and not feel connected to that person through our common humanity. Telling our stories is a process of self-reflection. In telling our stories we articulate how we understand what has happened to us, why and how it has impacted us, and how we see ourselves and others. Our way of constructing our stories, which shapes our view of reality, becomes more transparent to us when we speak the story out loud to others. To feel connected and respected, people need to tell their stories and have others listen. Having others listen to your story is a function of power in our culture. The more power you have, the more people will listen respectfully to your story. To listen respectfully to a person’s story is to honor that person’s intrinsic worth and to empower the storyteller in a constructive way. “Cultural dialogical” practice are world wide and include Native American traditions observed and recorded by Benjamin Franklin. In Arabic this form of group communication has been called a “Diwan”.